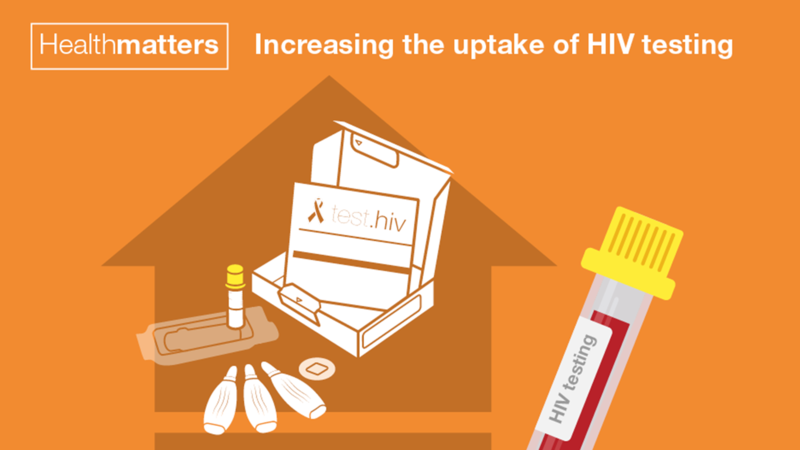 We hope our latest edition of Health Matters – on the subject of “Increasing the uptake of HIV testing” – will help you and other health professionals by compiling key facts, figures and evidence of effective interventions. Where we can, we’re also committed to answering your questions and taking on your feedback. In this blog we’ve published the answers to a number of Health Matters HIV testing questions we received from professionals across the UK at and after the launch teleconference (podcast available here). What is the clinical term is for the testing kits? I know they’re called self-sampling, but is there any other term that clinicians use, as I will be presenting to GPs and clinicians? Also, are they used for screening any other type of long-term condition? Everyone will understand you if you refer to self-sampling kits. It's a very well-known terminology, so that’s not a problem. It is important to be clear about the difference between self-testing and self-sampling, which are two very different things. Self-sampling is where a person takes a sample of their blood and sends it away for analysis; self-testing is where the person takes a sample of their blood and uses the kit in front of them to test it. Self-sampling is used for a number of other situations, for example in the MMR (Mumps-Measles-Rubella) and hepatitis B programmes. It’s not unusual to use self-sampling services or self-sampling techniques to try and get to those populations that you wish to reach. In the Public Health England HIV home sampling service, we do not test for anything other than HIV. It has been through community work that some populations have reported that they do not want the self-sampling kits to be sent to their homes. Would it be possible for local authorities to have a stock of these kits so that can be given during outreach sessions? PHE and local authorities are aware of this need and have asked the provider to provide outreach packs by the end of January. We will then pilot their use in various different settings during the first quarter of 2017. Depending on the results of the pilot we will make these packs more widely available. Could I ask if this is a pilot study (if so, for how long) and in what areas the self-sampling kits are currently available? I tried to order a kit for my son whilst I was on the conference call, but was informed online that the test is not currently available in my area. We would require more information on whether the refusal was at the stage when the postcode was requested or at the screening stage. If at the postcode stage, then this is an error we can rectify. Between 7 November and 8 January there should be no constraints on area of residence, as PHE is paying for all kits requested and thus the service is open to everyone resident in England. If at the screening stage, then the service is for those individuals considered at higher risk of having an infection and it may be that your son does not fall into one of these categories. I would like to ask about those patients who present and are diagnosed late. Do we know what the barriers are to them presenting? Our surveillance systems do not specifically collect detailed information on reason for, or delays in, testing, although there have been a number of projects across the country which have looked into this. In addition to people not being aware of their risk, HIV stigma remains a notable barrier. We need to do a lot of work to raise awareness around HIV as a condition that can be treated with medication, and that people living with HIV now live largely free of ill health and have a normal life span. In addition, we also know that prompt diagnosis and early treatment reduces onward transmission of the virus can be reduced. This is known as Treatment as Prevention or TasP. People may not necessarily be aware that an HIV test is free, accessible and confidential. So these may be additional personal barriers. There are a few structural barriers as well and this is why we have introduced the HIV self-sampling programme, because some individuals do not necessarily feel comfortable going to their general practitioner or going to their sexual health clinic. What HIV testing programmes are there in custodial establishments? Service (NOMS) to roll out opt-out testing for HIV and other blood-borne viruses in prisons. This is being developed and about 30 prisons are involved with the programme at the moment, but this is eventually going to cover the whole country. PHE published its HIV testing report on 1 December and this has some information about this programme, and we hope to include a much fuller update in next year’s report. Do you have examples of areas that have successfully undertaken GP testing in their local area? PHE has published a synthesis of evidence on measures to reduce late HIV diagnosis by improving HIV testing, which includes a section on HIV testing in primary care. PHE has also funded HIV testing in general practice, as part of a collaboration with the Elton John AIDS foundation and Leeds City Council. This targeted resources and support on practices with catchment areas in deprived areas and where there were higher levels of at-risk populations. In my area we are very keen to encourage general practice to be more aware of HIV when looking at people when they present, especially repeat presentations, and to get general practice on board with HIV testing. Did I read somewhere that you are doing some work with general practice and primary care around normalising HIV testing? We are committed to normalising HIV testing and to reducing the barriers to testing overall. We are encouraging more testing among GP practices, especially in the high prevalence and extremely high-prevalence areas. There have been some very good examples of where GPs have grasped the nettle of HIV testing and we have seen some really good results in that environment. There is the sexual health in practice training programme, which is not just about HIV but also more broadly about sexual health. This has been a very successful programme and it is a GP-led intervention, with recognition of the time and other pressures in primary care. There are also a range of online training programmes that have been developed through the RCGP. However there are still continuing barriers regarding pressure of time. For commissioners, there is the Sexual Health Commissioners forum, where you can find other examples of good practice. We know from experience that once a GP practice does diagnose someone with HIV, it actually changes the attitude towards testing. One of the things that the sexual health in practice training does is to focus on hepatitis. Hepatitis has got a higher prevalence in some areas and therefore may be easier for GPs to detect. When they actually do diagnose hepatitis, it can transform GPs’ attitudes to HIV testing. So, it might be that one needs to look at a blood-borne virus perspective, not just HIV, as a route in to engage GPs. As a practising GP, I think that a lot of the people who are undiagnosed haven’t even thought it might be a cause of their symptoms or a concern for them, or a risk. It’s a really unusual consultation for someone to come and ask for an HIV test. Do we need to be teaching and training GPs and practice nurses to be much more proactive? That is why there is an increasing emphasis about clinical indicator disease testing in general practice. This is a very good way in, just making it a routine test for these clinical indicator diseases. The data shows quite high background positivity rates in those populations. On engagement, we’ve contracted the Terrence Higgins Trust, as part of HIV Prevention England, to undertake national HIV prevention work. Part of that is to undertake sector leadership and stakeholder engagement, and that involves building capacity and disseminating best practice. They provide briefings not only to general practice, but they are running expert seminar days. So, there are opportunities there. In my area we are looking at HIV testing all medical admissions to hospital, as well as people newly registering with a GP. What are other areas doing about funding these additional tests? Is it the responsibility of CCGs or local authorities - is there any consensus? You have highlighted one of the challenges in terms of where the responsibility sits. PHE’s ‘Making it work’ lists who is responsible for commissioning HIV testing in different settings and circumstances. Local authorities are responsible for commissioning HIV testing including population screening in primary care and general medical settings. CCGs are responsible for HIV testing when clinically indicated in CCG-commissioned services including A&E and other hospital departments. NHSE commissions HIV testing when clinically indicated in general practice and other NHSE-commissioned services. The complexities in this system mean that we need to continue thinking about the local health economy and how partners work together around HIV and sexual health. Through engagement with your local area, particularly through the STP programme, for example, you can emphasise that increasing HIV testing should produce savings across the health economy, as well as an improvement in outcomes. Have you collated the sensitivity and specificity rates of self-sampling versus clinic testing, and any cost-benefit analysis? That would be really helpful when having conversations with microbiologists and others. All sexual health commissioners have received the report from the HIV self-sampling service. In that, we report the reactivity rate as either low or high reactivity. The high reactives are very likely to be confirmed as positive, as having an HIV diagnosis. We estimate from this data a positive predictive value of just over 70%, which considering we are screening a wider population, is very good. If you have any further questions, the team here at Public Health England will be very pleased to answer them. Please send your questions via email to healthmatters@phe.gov.uk.